Many activities have to be arranged and planned before the wedding day. Obtaining the marriage license should be at the top of the list of things to do. 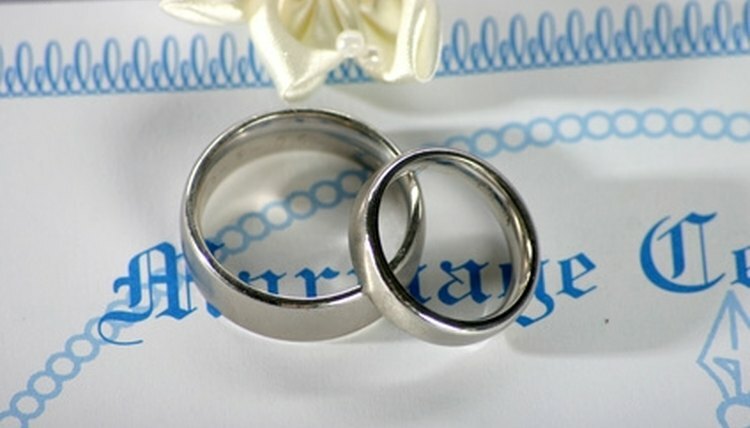 Believe it or not, many couples do not apply for a marriage license in a timely manner. In Pennsylvania, a marriage license is valid for 60 days and takes three days from the date of application to be obtained. County offices issue marriage licenses and have similar requirements. Apply in person together, bride and groom, for the marriage license at a county office that issues marriage licenses. The Marriage License Bureau is the county office for larger counties, such as Philadelphia, Allegheny and Butler, that issues licenses. Smaller counties, such as Delaware and Forest, issue licenses through the Clerk of Orphan's Court. Complete an application form for the marriage license. Counties such as Allegheny have an online application form that can be downloaded, printed and submitted to the Allegheny Marriage License Bureau. Produce a valid photo identification, such as a driver's license or passport, when applying for the license. A Social Security card or a birth certificate may also be required. Pick up the marriage license after the three-day waiting period. The applicant or a friend or relative may pick up the license. The license can also be mailed to the applicant's home. Carroll B. Knows has been writing how-to articles since 2009, specializing in a variety of topics such as mediation, relationships and cooking. Knows is currently working on a short storybook for children. B., Carroll. "How to Obtain Marriage License in Pennsylvania." , https://legalbeagle.com/6604016-obtain-marriage-license-pennsylvania.html. Accessed 23 April 2019.